Breathe in the fresh spring air! The BVAA is taking a field trip to the Tower Hill Botanical Garden on Wednesday, April 27th, 2016. 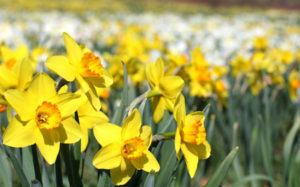 Tower Hill reports that their daffodil field is now at its peak, so it’s the time to go! And Wednesday is forecast for sunny weather. Because of the warm winter the field isn’t as lush as it’s been in years past, but it’ll still be a fun opportunity for great photography and painting! Let us know at the main INFO @ BVAA.org email address if you’d like to join us. The plan is to go in mid-afternoon when it’s both sunny and warm. Most people are arriving around 2pm but earlier or later is quite fine. Contact Lisa via text or cell or her gmail.com email address once you get there if you’d like to hook up. Or just meander over to the daffodils :). Also, Tower Hill is running a photography contest. The photo must have been taken between April 1 and April 30, 2016 at Tower Hill. Check out the full details and enter!